A classic Irish sports bar, originating in 1922. The spirit of Harry Harrington shines, through each great pint and lively, neighborhood craic. With 7 TV's, every seat is the BEST seat in the house. Not to mention, Harry's has earned 94 years of hosting experience. In 1907, a group of nuns built 460 Larkin as a boy's home. Soon after, they began leasing the bottom floor as a bar, in an effort to make money. A business idea, that has proven to withstand the test of time. 93 years later, Harry Harrington's continues to represent a watering hole full of character, life, and great Guinness. Come by for a drink with the oldest bartender of this side of the Mississippi! Originally from Galway Ireland, Ronan is a pro in all things sports bars. When the opportunity arose to buy the Irish Bank Peter, Stephanie and Ronan knew they would make a great partnership. Ronan's dry wit and a great knowledge of all things sports makes him an ideal fit for your neighborhood sports bar. It's a romantic tale. One that starts thirty years ago. An Irish lad from Donegal, Ireland, stumbles into San Francisco. Looking for work, he's grateful for an Irish watering hole, where he can make job inquiries and interview calls out of. It could be said, the phone booth at Harry Harrington's, was Peter's first office. 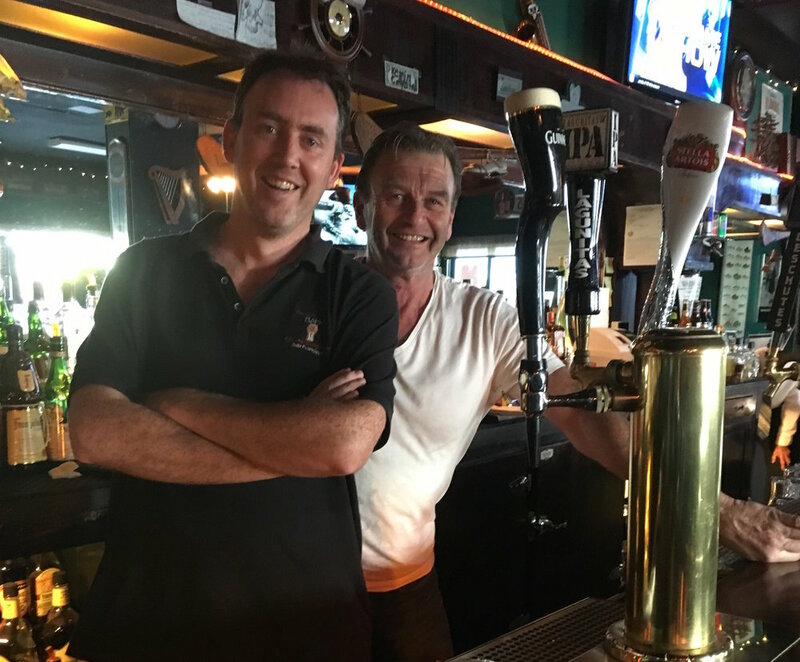 Today, the owner and operator of Harry Harrington's Pub will welcome you with a smile, great Guinness, and friendly conversation. A veteran to the bartending scene, Stephanie is a classic professional. From Wellington, New Zealand, she always felt comfortable in Irish pubs. As the second bartender and longtime owner of The Irish Bank, she's no stranger to pouring a great pint. With a sweet twinkle in her eye, she'll welcome you with warm hospitality and great service! Looking for a classic pint? Meet the 2nd oldest bartender in the US. With eighty-nine years under his belt, Jimmy keeps his look dapper and his drinks honest. Featuring a pool table and dart board, that can be converted into a table and becomes great for private parties! !